This article is about the race between Oxford and Cambridge universities. For other uses, see Boat race (disambiguation). The Boat Race is an annual rowing race between the Cambridge University Boat Club and the Oxford University Boat Club, rowed between men's and women's open-weight eights on the River Thames in London, England. It is also known as the University Boat Race and the Oxford and Cambridge Boat Race. The men's race was first held in 1829 and has been held annually since 1856, except during the First and Second World Wars. The first women's event was in 1927 and the race has been held annually since 1964. Since 2015, the women's race has taken place on the same day and course, and since 2018 the combined event of the two races has been referred to as "The Boat Race". In the 2019 race, which took place on Sunday 7 April 2019, Cambridge won the men's and women's races as well as both reserve races. The course covers a 4.2-mile (6.8 km) stretch of the Thames in West London, from Putney to Mortlake. Members of both teams are traditionally known as blues and each boat as a "Blue Boat", with Cambridge in light blue and Oxford in dark blue. As of 2019, Cambridge has won the men's race 84 times and Oxford 80 times, with one dead heat. Cambridge has led Oxford in cumulative wins since 1930. In the women's race, Cambridge have won the race 44 times and Oxford 30 times. Cambridge has led Oxford in cumulative wins since 1966. A reserve boat race has been held since 1965 for the men and 1966 for the women. The tradition was started in 1829 by Charles Merivale, a student at St John's College, Cambridge, and his Old Harrovian school friend Charles Wordsworth who was studying at Christ Church, Oxford. The University of Cambridge challenged the University of Oxford to a race at Henley-on-Thames but lost easily. Oxford raced in dark blue because five members of the crew, including the stroke, were from Christ Church, then Head of the River, whose colours were dark blue. There is a dispute as to the source of the colour chosen by Cambridge. The second race was in 1836, with the venue moved to a course from Westminster to Putney. Over the next two years, there was disagreement over where the race should be held, with Oxford preferring Henley and Cambridge preferring London. Following the official formation of the Oxford University Boat Club, racing between the two universities resumed in 1839 on the Tideway and the tradition continues to the present day, with the loser challenging the winner to a rematch annually. The race in 1877 was declared a dead heat. Both crews finished in a time of 24 minutes and 8 seconds in bad weather. The verdict of the race judge, John Phelps, is considered suspect because he was reportedly over 70 and blind in one eye. Rowing historian Tim Koch, writing in the official 2014 Boat Race Programme, notes that there is "a very big and very entrenched lie" about the race, including the claim that Phelps had announced "Dead heat ... to Oxford by six feet" (the distance supposedly mentioned by Phelps varies according to the telling). Phelps's nickname "Honest John" was not an ironic one, and he was not (as is sometimes claimed) drunk under a bush at the time of the finish. He did have to judge who had won without the assistance of finish posts (which were installed in time for the next year's race). Some newspapers had believed Oxford won a narrow victory but their viewpoint was from downstream; Phelps considered that the boats were essentially level with each surging forward during the stroke cycle. With no clear way to determine who had surged forward at the exact finish line, Phelps could only pronounce it a dead heat. Koch believes that the press and Oxford supporters made up the stories about Phelps later, which Phelps had no chance to refute. A portrayal of the dead heat finish in 1877. In 1959 some of the existing Oxford blues attempted to oust president Ronnie Howard and coach Jumbo Edwards. However, their attempt failed when Cambridge supported the president. Three of the dissidents returned and Oxford went on to win by six lengths. Disagreements over the training regime of Dan Topolski, the Oxford coach ("He wanted us to spend more time training on land than water! ", lamented Lyons), led to the crew walking out on at least one occasion, and resulted in the coach revising his approach. A fitness test between Clark and club president Donald Macdonald (in which Clark triumphed) resulted in a call for Macdonald's removal; it was accompanied with a threat that the Americans would refuse to row should Macdonald remain in the crew. As boat club president, Macdonald "had absolute power over selection", and when he announced that Clark would row on starboard, his weaker side, Macdonald would row on the port side and Tony Ward was to be dropped from the crew entirely, the American contingent mutinied. After considerable negotiation and debate, much of it conducted in the public eye, Clark, Penny, Huntington, Lyons and Fish were dropped and replaced by members of Oxford's reserve crew, Isis. The race was won by Oxford by four lengths, despite Cambridge being favourites. In 1989 Topolski and author Patrick Robinson's book about the events, True Blue: The Oxford Boat Race Mutiny, was published. Seven years later, a film based on the book was released. Alison Gill, the then-president of the Oxford University Women's Boat Club, wrote The Yanks at Oxford, in which she defended the Americans and claimed Topolski wrote True Blue in order to justify his own actions. River and Rowing Museum founder Chris Dodd described True Blue as "particularly offensive" yet also wrote "[Oxford] lacked the power, the finesse—basically everything the pre-mutiny line-up had going for it." In the 2012 race, after almost three-quarters of the course had been rowed, the race was halted for over 30 minutes when a lone protester, Australian Trenton Oldfield, entered the water from Chiswick Eyot and deliberately swam between the boats near Chiswick Pier with the intention of protesting against spending cuts, and what he saw as the erosion of civil liberties and a growing culture of elitism within British society. Once he was spotted by assistant umpire Sir Matthew Pinsent, both boats were required to stop for safety reasons. The umpire, John Garrett, decided to restart the race from the eastern end of Chiswick Eyot. Shortly after the restart the boats clashed and the oar of Oxford crewman Hanno Wienhausen was broken. Garrett judged the clash to be Oxford's fault and allowed the race to continue. Cambridge quickly took the lead and went on to win the race. The Oxford crew entered a final appeal to the umpire which was quickly rejected; and Cambridge were confirmed as winners by ​4 1⁄4 lengths. It was the first time since 1849 that a crew had won the boat race without an official recorded winning time. After the end of the race Oxford's bow man, Alex Woods, received emergency treatment after collapsing in the boat from exhaustion. Because of the circumstances, the post-race celebrations by the winning Cambridge crew were unusually muted and the planned award ceremony was cancelled. Oldfield was convicted in October 2012 of causing a public nuisance, fined £750 and sentenced to six months' imprisonment. In June 2013 he was refused leave to remain in the UK, a decision against which he successfully appealed, with the appeal judge stating that there was "a public interest in providing a platform for protest at both common law and the European Convention on Human Rights". In the 1912 race, run in extremely poor weather and high winds, both crews sank. Oxford rowed into a significant early lead, but began taking on water, and made for the bank shortly after passing Hammersmith Bridge to empty the boat out: although they attempted to restart, the race was abandoned at this point because Cambridge had also sunk, while passing the Harrods Depository. Cambridge also sank in 1859 and in 1978, while Oxford did so in 1925, and again in 1951; the 1951 race was re-rowed on the following Monday. In 1984 the Cambridge boat sank after colliding with a barge before the start of the race, which was then rescheduled for the next day. In 2016, at Barnes Bridge, Cambridge women began to sink and received advice from the umpire to pull to the side. The Cambridge cox indicated that she wanted to continue to complete the course and was allowed to do so. From the first women's event in 1927, the Women's Boat Race was run separately from the men's event until 2015. A significant inequality existed between the two events. Changes in recent years, arising significantly from the sponsorship of Newton Investment Management, brought the Women's Race onto a more level playing field, with the events being held together on The Tideway since 2015 and new training facilities for the women, comparable to those of the men, being in place since 2016. The course is 4 miles and 374 yards (6.779 km) from Putney to Mortlake, passing Hammersmith and Barnes; it is sometimes referred to as the Championship Course, and follows an S shape, east to west. The start and finish are marked by the University Boat Race Stones on the south bank. The clubs' presidents toss a coin (the 1829 sovereign) before the race for the right to choose which side of the river (station) they will row on: their decision is based on the day's weather conditions and how the various bends in the course might favour their crew's pace. The north station ('Middlesex') has the advantage of the first and last bends, and the south ('Surrey') station the longer middle bend. During the race the coxes compete for the fastest current, which lies at the deepest part of the river, frequently leading to clashes of blades and warnings from the umpire. A crew that gets a lead of more than a boat's length can cut in front of their opponent, making it extremely difficult for the trailing crew to gain the lead. For this reason the tactics of the race are generally to go fast early on, and few races have a change of the lead after halfway (though this happened in 2003, 2007 and 2010). The race is rowed upstream, but is timed to start on the incoming flood tide so that the crews are rowing with the fastest possible current. If a strong wind is blowing from the west it will be against the tide in places along the course, causing the water to become very rough. The conditions are sometimes such that an international regatta would be cancelled, but the Boat Race has a tradition of proceeding even in potential sinking conditions (see Sinkings above). Oxford boats from Westminster School Boat Club (left), and Cambridge from King's College School Boat Club (right). Both clubs are near the Start, just downstream of the Black Buoy. The crews warm up by rowing downstream below Putney Bridge before taking their places at the start. The race starts from two stake boats moored so that the competitors' bows are in line with the first University Stone. The winner of the toss has the choice of station. The Surrey station won 10 out of the 15 races 1994–2008 – though this is not statistically significant. Coxes raise their arms while their VIIIs are getting into position. When both crews are ready, the Umpire starts the race by waving a red flag. In the straight section after the start the Middlesex crew tries to hold the fastest water on the centre line of the river. Roughly marks the end of the Putney Boat Houses. The Black Buoy has been painted yellow to avoid collisions. 'Craven Cottage': crews stay wide (preferring the Surrey bank) round the bend as the area in front of the football ground (known as 'the Fulham flats') is shallow, with slack water. The 'post' is in fact a stone monument to rowing coach Steve Fairbairn. Exactly a mile from the Boat Race start, it is a traditional timing point. The Middlesex bank water continues to be shallow and slack all the way to Hammersmith Bridge. This section is called the "Crabtree Reach" after the Crabtree Tavern pub on the Middlesex bank (just to the right of the camera). Previously the warehouse for the famous shop, now flats. For the next 8–9 minutes the bend will be in Surrey's favour. The deepest water now is closer to the Surrey bank. Coxes aim for the second lamp-post from the left which marks the deepest part of the river and therefore the fastest line. 80%–85% of boats ahead at Hammersmith Bridge have won, though only 50% in the 6 years up to 2008. The turning point comes once the crews are under Hammersmith Bridge. 1.8 miles have been rowed; the whole width becomes choppy when there is any form of westerly. The next 3–4 minutes where still side-by-side give the Surrey crew their last advantage. A tree-covered river island. The river is briefly straight, and the deepest water is central. Just visible to crews, behind the eyot. If a south-west breeze picks up then the waves will be as high as they get along the Championship Course against the upstream tide here. 2.87 miles have been rowed. When strong prevailing winds strike, the built-up inside of the Middlesex bend gives that crew the calmer water. The Crossing 51°28′44″N 0°15′02″W﻿ / ﻿51.47879°N 0.250583°W﻿ / 51.47879; -0.250583﻿ (The Crossing) Marks the end of the long Surrey bend. The deep water channel is in the centre of the river. The deepest, faster water is slightly close to the Middlesex bank at this point, the water near the Surrey bank is shallow. Crews must pass through the centre arch. 95% of boats leading here have won. Only one boat has won since 1945 when trailing at Barnes Bridge: Oxford came from behind this late in 2002. The Barnes Bridge bend by Emanuel School Boat House is very tight: if the crews are level then the coxes may jostle, subject to directions, for the centre. Spanning almost the last 300 metres of the course, at least 3.95 miles (6.36 km) have been rowed. The finish, just before Chiswick Bridge, is marked by the University Stone on the south bank and a University Post on the north bank. The Boat Race trophy as seen in 2014. At the conclusion of the race, the boats come ashore at Mortlake Anglian & Alpha Boat Club, directly upriver of Chiswick Bridge. Here, shortly after the race, the Boat Race trophy is presented to the winning crew. It is traditional for the winning side to throw their cox into the Thames to celebrate their achievement. Moved from the original festivities by the stone in Mortlake, these are therefore at the clubhouse by Grove Park, Chiswick, west of the bridge. Nonetheless the arms of the London Borough of Richmond upon Thames, covering more than half of the Surrey bank, has two griffin supporters that hold oars, one light blue, one dark, in reference to the Boat Race, colours which are 'later tinctures' in English heraldry. During its early years (1927 to 1976 with several gaps) the Women's Boat Race alternated between The Isis in Oxford and the River Cam in Cambridge over a distance of about 1,000 yards. On two occasions, in 1929 and 1935, the race was held on the Tideway in London. Unlike the men’s race, the official women's race continued in most years through the Second World War. From 1977 to 2014, the women's boat race was held on a 2000 meter course as part of the Henley Boat Races. In 2013 the entire Henley Boat Races was moved to Dorney Lake due to rough water at Henley. The race first appeared in a short film of the 1895 race entitled "The Oxford and Cambridge University Boat Race", directed and produced by Birt Acres. Consisting of a single shot of around a minute, it was the first film to be commercially screened in the UK outside London. The event is now a British national institution, and is televised live each year. The women's race has received television coverage and grown in popularity since 2015, attracting a television audience of 4.8 million viewers that year. Prior to 2015, the women's race received little media coverage. BBC Television first covered the men's race in 1938, the BBC having covered it on radio since 1927. For the 2005 to 2009 races, the BBC lost the television rights to ITV, after 66 years, but it returned to the corporation in 2010. On the radio John Snagge commentated for the BBC from 1930s to the early 1980s on BBC Radio 2. Peter Jones, Brian Johnston and Robert Hudson commentated in the 1980s on BBC Radio 2 and Jon Champion, Tony Adamson and Peter Drury commentated for BBC Radio 5 and 5 Live in the 1990s. Howard Marshall commentated on the first BBC TV Boat Race in 1938 with a camera at the start and the finish. Desmond Hill commentated for the BBC in the 1960s and Harry Carpenter commentated for the BBC in the 1970s up to 1990 and Gerald Sinstadt commentated in 1991 and 1992 while Barry Davies became the voice of the Boat Race for the BBC for the years 1993 to 2004 and Steve Rider was the host, previous BBC hosts were David Coleman, Frank Bough and Harry Carpenter. Peter Drury then took over as the main commentator for ITV from 2005 to 2009 while coverage was presented by Gabby Logan, then Mark Durden-Smith and finally Craig Doyle. Andrew Cotter has commentated for the BBC since its return in 2010 with Dan Topolski and Wayne Pommen while Clare Balding has presented usually with Sir Matthew Pinsent, Sir Steve Redgrave and others within the world of rowing. Jonathan Legard commentated on the 2012 Race while Andrew Cotter was at the US Masters for the BBC but has returned in 2013. Barry Davies has returned to commentate on LBC Radio when the TV coverage moved to ITV. BBC World News holds the worldwide rights to the race taking UK coverage. Ethnographer Mark de Rond described the training, selection, and victory of the 2007 Cambridge crew in The Last Amateurs: To Hell and Back with the Cambridge Boat Race Crew. The race is for heavyweight eights (i.e. eight rowers with a cox steering), with no restrictions on weight or gender. There have been a number of female coxes – the first to appear in the Boat Race was Sue Brown for Oxford in 1981 – but in practice the rowers are always male. Although the contest is strictly between amateurs, and the competitors must be students of the university for which they race, the training schedules the teams undertake are very gruelling. Typically each team trains for six days a week for six months before the event. Such is the competitive spirit between the universities that it is common for Olympic standard rowers to compete, notably including four-time Olympic gold medallist Sir Matthew Pinsent, who rowed for Oxford in 1990, 1991, and 1993. Olympic gold medallists from 2000 – James Cracknell (Cambridge 2019), Tim Foster (Oxford 1997), Luka Grubor (Oxford 1997), Andrew Lindsay (Oxford 1997, 1998, 1999) and Kieran West (Cambridge 1999, 2001, 2006, 2007), 2004 – Ed Coode (Oxford 1998), and 2008 – Jake Wetzel (Oxford 2006) and Malcolm Howard (Oxford 2013, 2014) have also rowed for their university. Other famous participants include Andrew Irvine (Oxford 1922, 1923), Lord Snowdon (Cambridge 1950), Colin Moynihan (Oxford 1977), actor Hugh Laurie (Cambridge 1980), TV presenter Dan Snow (Oxford 1999, 2000, 2001) and Conspicuous Gallantry Cross recipient Robin Bourne-Taylor (Oxford 2001, 2002, 2003, 2005). Oxford University does not offer sport scholarships at entry; student-athletes are not admitted differently to any other students and must meet the academic requirements of the university, with sport having a neutral effect on any application. Likewise, bursaries and scholarship opportunities for athletes at the University of Cambridge are only open to those students who have already been admitted to the University on academic merit. In order to protect the status of the race as a competition between genuine students, the Cambridge University Blues Committee in July 2007 refused to award a blue to 2006 and 2007 Cambridge oarsman Thorsten Engelmann, as he did not complete his academic course and instead returned to the German national rowing team to prepare for the Beijing Olympics. This has caused a debate about a change of rules, and one suggestion is that only students who are enrolled in courses lasting at least two years should be eligible to race. The question whether the Boat Race crews are up to the standard of international crews is difficult to judge, since the Boat Race crews train for a long-distance race early in the season, so their training schedule is quite different from crews training for international regattas over 2000 metres that take place later in the year. According to British Olympic gold medallist Martin Cross, Boat Race crews of the early 1980s were viewed as "a bit of a joke" by some international-level rowers of the time. However, their standard has improved substantially since then. Current Boat Race crews do race against some club and international crews in the build-up to the race, and are competitive against them, but again these matches are over various non-standard distances, against crews that might not have been together as long as the Oxbridge crews. In 2005 a strong Oxford crew, similar to the crew who had rowed in the Boat Race, entered the Grand Challenge Cup at Henley Royal Regatta, losing to the winning German international crew in the first round by a third of a length. The same year, Cambridge won the Ladies Challenge Plate at the same regatta. In 2007 Cambridge were entered in the London Head of the River Race, where they should have been measured directly against the best crews in Britain and beyond. However the event was called off after several crews were sunk or swamped in rough conditions. Cambridge were fastest of the few crews who did complete the course. The Boat Race has been sponsored since 1976, with the money spent mainly on equipment and travel during the training period. The sponsors do not have their logos on the boats, but do have their logo on kit during the race. They also provide branded training gear and have some naming rights. Boat Race sponsors have included Ladbrokes, Beefeater Gin, Aberdeen Asset Management, and the business process outsourcing company Xchanging, who sponsored the race until 2012. Controversially, in the renewal of the deal with Xchanging, the crews agreed to wear the sponsor's logo on their kit during the race itself, in exchange for increased funding. Prior to this, all sponsorship marks had been scrupulously discarded on boating for the competition, in line with the race's amateur and ‘Corinthian’ spirit. Xchanging also became title sponsor in November 2009 so, from the 156th Race until 2012, the event was known as The Xchanging Boat Race. In 2013 the sponsor BNY Mellon took over and it became the BNY Mellon Boat Race. From 2016-18, BNY Mellon and Newton Investment management donated the title sponsorship to Cancer Research UK. 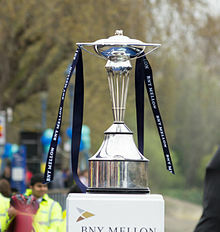 The Women's Boat Race 2011 was the first to be sponsored by Newton Investment Management, a subsidiary of BNY Mellon. Previously the crews had no sponsorship and were self funded. Newton have remained the sponsor since then and increased the amount of funding significantly. Although the Boat Race crews are the best-known, the universities both field reserve crews. The reserves race takes place on the same day as the main race. The Oxford men's reserve crew is called Isis (after the Isis, a section of the River Thames which passes through Oxford), and the Cambridge reserve men's crew is called Goldie (the name comes from rower and Boat Club president John Goldie, 1849–1896, after whom the Goldie Boathouse is named). The women's reserve crews are Osiris (Oxford) and Blondie (Cambridge). The Henley Boat Races, usually held a week before the Boat Race, host the lightweight men's and women's races and their reserve races. There is also an intercollegiate men's and women's race. A veterans' boat race, usually held on a weekday before the main Boat Race, takes place on the Thames between Putney and Hammersmith. Training for the Boat Race officially begins in September, before the start of term. The first public tests are in November at the British Indoor Rowing Championships, where each university sends around 20 rowers to compete. Everyone races 2 km on an indoor rower with the club presidents using adjacent machines. Both universities also send crews to the Head of the River Fours race in London, which is raced over the reverse Boat Race course, that is to say the Championship course from Mortlake to Putney. In December, the coaches put out Trial Eights where two crews from the same university race each other over the full Boat Race course. These crews are given names such as Kara and Whakamanawa (Māori words for strength and honour, Cambridge 2004) or Cowboys and Indians (Oxford 2004). Other trials boat names have included such pairings as Guns and Roses. Over the Christmas period the squads go on training camps abroad, where final places for the blue boats are decided. After the final blue boat crews have been decided, they race against the top crews from the UK and abroad (e.g. in recent years the men's crew have raced Leander, Molesey, the German international crew, and a composite crew of Olympic scullers). These races are only over part of the course (from Putney to Chiswick Eyot). In case of injury or illness, each university men's crew has ten extra rowers, eight in the reserve boats Isis and Goldie, and two as the spare pair. Isis and Goldie race 30 mins before the Blue Boat event over the same course. As for the spare pair, in the week before the main event they race each other from the mile post to university stone (i.e. from a point one mile into the Championship Course back to the Boat Race start). In the final week, there is also an official weigh in and the average crew weights are announced. The perceived slight advantage of being the heavier crew leads to the practice of drinking large volumes of water directly before the weigh in order to artificially increase weight for a short period of time. Boat race became such a popular phrase that it was incorporated into Cockney rhyming slang, for "face". In the stories of P. G. Wodehouse, several characters allude to Boat Race night as a time of riotous celebration (presumably after the victory of the character's alma mater). This frequently sees the participants in trouble with the authorities. In Piccadilly Jim, it is mentioned that Lord Datchett was thrown out of the Empire Music Hall every year on Boat Race night while he was an undergraduate. Bertie Wooster mentions he is "rather apt to let myself go a bit on Boat Race night" and several times describes being fined five pounds at "Bosher Street" (possibly a reference to Bow Street Magistrates' Court) for stealing a policeman's helmet one year; the beginning of the first episode of the television series Jeeves and Wooster shows his court appearance on this occasion. In the short story Jeeves and the Chump Cyril, he describes having to repeatedly bail out of jail a friend who is arrested every year on Boat Race night. In the Jennings books by Anthony Buckeridge the protagonist's teacher Mr Wilkins is a former Cambridge rowing blue. The 1969 film The Magic Christian features the Boat Race, as Sir Guy makes use of the Oxford crew in one of his elaborate pranks. There have been 165 official races in 190 years. There have been 74 races in 93 years. ^ a b c d e f g h i j "The Boat Race Results". The Boat Race Limited. Retrieved 13 April 2012. ^ a b "Partners". The Boat Races. Retrieved 27 March 2016. ^ a b "RNLI". The Boat Race. Retrieved 8 April 2019. ^ "Boat Race Practice – An Oxford victory". The Times. 16 March 1927. p. 7. ^ "First ever women's event from 88 years ago was rather different to modern day". The Telegraph. 10 April 2015. Retrieved 11 April 2015. ^ a b "Boat Race – Results – Women". The Boat Race Company Limited. Retrieved 11 April 2015. ^ a b "Boat Races: Oxford triumph in men's race after Cambridge women win". BBC Sport. 2 April 2017. Retrieved 2 April 2017. ^ a b "The Course". The Boat Race Company Limited. Retrieved 7 April 2016. ^ a b Morrissey, Helena (4 April 2015). "Helena Morrissey: 'Tide turns in favour of boat race women'". The Daily Telegraph. Retrieved 17 April 2015. ^ Mahoney, Lizzie (19 February 2014). "New Women's Boat Race trophy unveiled". The Cambridge Student. Retrieved 16 April 2015. ^ a b "History". Henley Boat Races. Retrieved 15 April 2015. ^ a b "Henley Boat Races 2007". CUWBC. 2 April 2007. Retrieved 18 April 2015. ^ a b c d "Pulling Together". Cambridge Alumni Magazine (74 Lent 2015): 12. Retrieved 19 March 2015. ^ a b c "A brief history of the Oxford-Cambridge Varsity event – from the perspective of women". The Telegraph. 13 March 2015. Retrieved 11 April 2015. ^ a b "University women's race women's success". The Times. 18 March 1935. p. 6. ^ "Record crowd for Easter Boat Race". London Evening Standard. Archived from the original on 4 April 2010. Retrieved 31 August 2014. ^ Smith, Oliver (25 March 2014). "University Boat Race 2014: spectators' guide". The Daily Telegraph. Retrieved 7 April 2014. ^ a b "The Boat Race origins". The Boat Race Limited. Retrieved 12 October 2014. ^ a b Bosque, Juan Alejandro. "Book of Days Tales – The Boat Race". Book of Days Tales. Retrieved 12 October 2014. ^ "1829 Boat Race – WHERE THAMES SMOOTH WATERS GLIDE". thames.me.uk. Retrieved 12 October 2014. ^ a b "1877 Boat Race – WHERE THAMES SMOOTH WATERS GLIDE". thames.me.uk. Retrieved 12 October 2014. ^ "Perfection from Torvill and Dean". ESPN. Retrieved 12 October 2014. ^ a b "Start of the annual race". The Boat race Limited. Retrieved 12 October 2014. ^ a b Koch, Tim (2014). "Oxford Won, Cambridge Too". Official Boat Race Programme. ^ "The University Boat Race". The Times. 26 March 1877. p. 8. ^ a b "Post war and the arrival of television". The Boat Race Limited. Retrieved 12 October 2014. ^ Dodd, Christopher; Marks, John (2004). Battle of the Blues The Oxford & Cambridge Boat Race from 1829. P to M Limited. p. 72. ISBN 0-9547232-1-X. ^ Baker, Andrew (6 April 2007). "When mutineers hit the Thames". The Daily Telegraph. Retrieved 11 August 2014. ^ a b c d Dodd, Christopher (July 2007). "Unnatural selection". Rowing News. pp. 54–63. ^ a b c Johnston, Chris (25 November 1996). "Mutiny on the Isis". Times Higher Education. Retrieved 11 August 2014. ^ Railton, Jim (28 March 1987). "Ill wind plagues Blues of 1987". The Times (62728). p. 42. ^ Peck, Tom (29 March 2013). "No regrets, says Trenton Oldfield, man who ruined the boat race – but don't worry, he won't be back". The Independent. Retrieved 31 August 2014. ^ a b "Boat Race: Man charged over swimming incident". BBC Sport. Retrieved 10 April 2012. ^ Millar, Paul (8 April 2012). "Shock and oar as Australian protest swimmer wrecks Oxbridge boat race". Sydney Morning Herald. Retrieved 10 April 2012. ^ Bull, Andy (7 April 2012). "Oxford bow Alex Woods recovering in hospital after Boat Race collapse". The Observer. Retrieved 10 April 2012. ^ "Race: Royal Marines to help with security". BBC News. 9 March 2013. Retrieved 1 September 2014. ^ "Boat Race protester Trenton Oldfield jailed". BBC News. 19 October 2012. Retrieved 31 August 2014. ^ "Boat Race protester Trenton Oldfield must leave UK". BBC News. 24 June 2013. Retrieved 24 June 2013. ^ Drape, Julian (8 December 2013). "'Enough is enough': boat protester's wife". The Australian. Retrieved 31 August 2014. ^ Booth, Robert (9 December 2013). "Boat race protester Trenton Oldfield wins appeal against deportation". The Guardian. Retrieved 31 August 2014. ^ Muir, Hugh (23 December 2013). "Judge rules Home Office's bid to deport Boat Race protester 'an overreaction'". The Guardian. Retrieved 31 August 2014. ^ "Boat Race – WHERE THE SMOOTH WATERS GLIDE". Thames.me.uk. Retrieved 31 August 2014. ^ "Rowing back the years". BBC Sport. 31 March 2003. Retrieved 19 April 2014. ^ "Oxford University – The Boat Races". University of Oxford. Retrieved 13 March 2016. ^ "How it began". 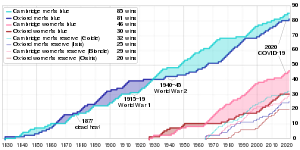 The Race History. The Boat Race Limited. 2006. Retrieved 31 August 2014. ^ "The 10 worst mishaps in the history of sport". The Observer. 5 November 2000. Retrieved 22 March 2014. ^ "1984: Boat race halted before starting". BBC. 17 March 2005. Retrieved 10 April 2012. ^ Kingsbury, Jane; Williams, Carol (2015). Cambridge University Women's Boat Club 1941-2014 - The Struggle Against Inequality. Trireme. ISBN 9780993098291. ^ "The real reason the women's Boat Race is closing in? Deep pockets". The Telegraph. 20 March 2015. Retrieved 27 March 2016. ^ White, Jim; Mills, Emma; Robinson, Danielle; Saunders, Toby (5 April 2019). "Boat Race 2019: Oxford and Cambridge women admit tide has finally turned in their favour". The Telegraph. ISSN 0307-1235. Retrieved 8 April 2019. ^ Savva, Anna (1 December 2016). "Cambridge University set to open new boathouse in Ely". cambridgenews. Retrieved 8 April 2019. ^ Thomas, Lauren (11 December 2016). "ROWING - Opening of the new Cambridge University Boathouse at Ely". www.sport.cam.ac.uk. Retrieved 8 April 2019. ^ "Statistics of The Boat Race". Boat Race Company Limited. Archived from the original on 7 October 2014. Retrieved 18 March 2013. ^ "The Boat Race course". Web.archive.org. 28 November 2006. Archived from the original on 28 November 2006. Retrieved 10 April 2012. ^ a b c d e f "Rowing Chart" (PDF). Rowing on the Tideway. Port of London Authority. 6 September 2006. Retrieved 12 April 2008. ^ "The Oxford v Cambridge Boat Race". maabc.com. Archived from the original on 24 September 2013. Retrieved 12 April 2014. ^ Howard, Philip (13 March 1973). "Nine girls in a boat beat Oxford". The Times. p. 4. ^ Railton, Jim (15 March 1974). "Most exciting Boat Race for a decade". The Times. p. 13. ^ "Overview of British Film History". Learn about movie posters.com. Retrieved 7 April 2007. ^ "Boat race viewing figures delight BBC as 4.8m watch women's event". The Guardian. 12 April 2015. Retrieved 7 April 2016. ^ "Women's Boat Race 2015: equality will be true winner of historic meeting". The Guardian. 10 April 2015. Retrieved 27 March 2016. ^ a b "The real reason the women's Boat Race is closing in? Deep pockets". The Telegraph. 20 March 2015. Retrieved 27 March 2016. ^ "ITV drops Boat Race for football". BBC news. 9 December 2008. Retrieved 19 August 2014. ^ "The Boat Race – Personalities". The Boat Race Limited. Retrieved 31 August 2014. ^ "Oxford University Sport: FAQ". University of Oxford. Archived from the original on 6 November 2014. Retrieved 17 October 2014. ^ "University Sports: Bursaries and Scholarships". University of Cambridge. Archived from the original on 7 October 2014. Retrieved 17 October 2014. ^ "Engelmann punished for early exit". BBC. 17 July 2007. Retrieved 5 June 2009. ^ "Choppy waters ahead for Boat Race". BBC. 20 July 2007. Retrieved 10 April 2012. ^ Cross, Martin (9 April 2012). "Rowing is elitist, but not in the way Trenton Oldfield thinks". The Guardian. Retrieved 10 April 2012. ^ Quarrell, Rachel (1 April 2007). "Boat Race: Cambridge confidence gets big boost". The Daily Telegraph. London. Retrieved 25 May 2010. ^ "Boat Race sponsor Xchanging to end contract". BBC News. 29 March 2011. Retrieved 1 September 2014. ^ "Xchanging sponsorship of The Boat Race draws to a close". Xchanging. 29 March 2011. Archived from the original on 23 August 2011. Retrieved 1 September 2014. ^ Quarrell, Rachel (20 November 2009). "University Boat Race to have title sponsorship from 2010 onwards". The Daily Telegraph. London. Retrieved 1 September 2014. ^ "Xchanging becomes title sponsor of The Boat Race". The Boat Race Limited. Retrieved 20 November 2009. ^ "Boat Race – BNY Mellon announced as new Boat Race Title Sponsor". The Boat Race Limited. Retrieved 1 September 2014. ^ "The Boat Races Sponsors BNY Mellon & Newton Pull Together For Cancer Research UK – The Boat Race". 19 January 2016. ^ Gough, Martin (24 March 2009). "Students v Supermen". BBC News. Retrieved 27 March 2010. ^ Cracknell, James (25 March 2005). "Oxford bank on a flying start to counter light blues' finess". The Daily Telegraph. London. Retrieved 25 May 2010. ^ Kemmer, Suzanne. "Cockney Rhyming Slang". Words in English. Retrieved 19 December 2017. ^ Wodehouse, P. G. (2008) . Carry On, Jeeves (Reprinted ed.). London: Arrow Books. pp. 169–172. ISBN 978-0099513698. ^ "Jeeves Takes Charge". Jeeves and Wooster. 22 April 1990. 1 minutes in. ^ Buckeridge, Anthony (1952). Jennings and Darbyshire. Ch 24: Collins. ^ "The 2017 Blue Boats". The Boat Race Company Limited. Archived from the original on 20 March 2017. Retrieved 20 March 2017. ^ "The Boat Race Limited statistics". The Boat Race Limited. Archived from the original on 7 October 2014. Retrieved 1 September 2014. ^ "The Boat Race yearly results – men". The Boat Race Limited. Archived from the original on 24 September 2014. Retrieved 19 August 2014. Wikimedia Commons has media related to University Boat Race.